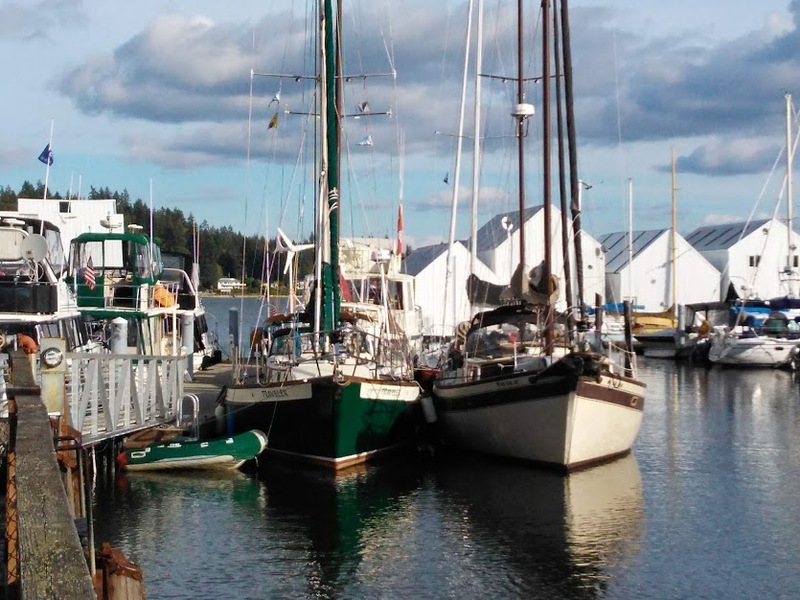 Saturday October 6th, a flotilla of four departed Budd Inlet bound for Oakland Bay and the Shelton Yacht Club. 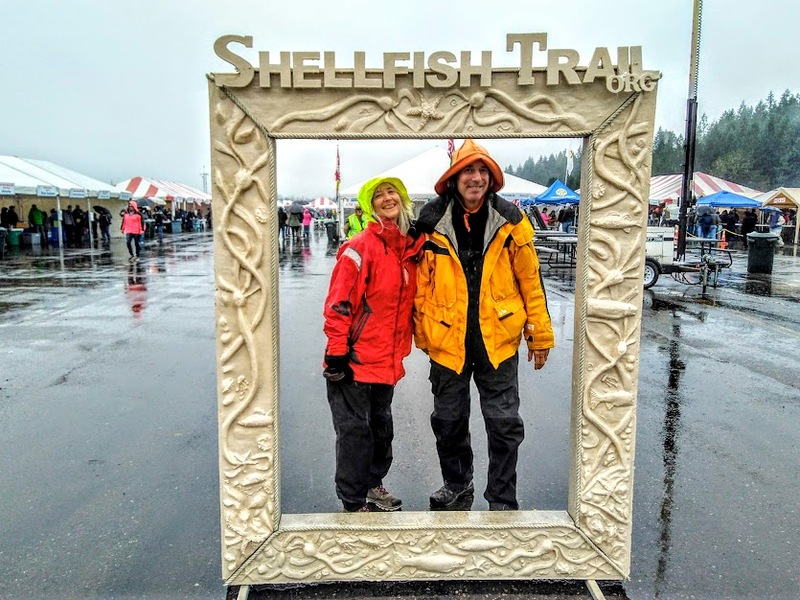 Our route took us north to Hope Island then through the dreaded Hammersley Inlet, a transit fraught with danger: shoals, grey whales, fast currents, and twists and turns of the topography. Scott and Connie on Traveler (Passport 42) were chased out of Budd Inlet by Rick and Ada with Amanda as crew on Clara June (Freeport 41) and we arrived together at Hope Island at 13:45, halfway through the rising tide, timed so that if we ran aground in the narrow channel we’d soon float off. Rick had a new chart plotter at the helm so he led our two boats towards the way- north entrance to Hammersley Inlet, avoiding the notorious Arcadia grounding. 30 foot off the Hungerford Point #2 red channel marker, we edged into Hammersley Inlet feeling our way with the depth sounder. We transited around the north shoreline, hugging land closely. As Clara June rounded Cape Horn the VHF squawked with Rick’s voice, “Watch for the grey whale mid channel!” I pulled back the throttle and put her in neutral as I edged to the side of the channel in time to see a beautiful gray whale arcing out of the water on our starboard bow. It surfaced soon after off our port side then disappeared with a flip of the tail. We continued on… amazed. Hammersley is like a river, with the channel first on one side then the other, following the contours of the land. The current was running with us and soon we caught up with two other SSSS boats making their way west. Katie Braun, skippering WindWalker, had Dave Chance (Island Sailing Club instructor) aboard along with crew Doug Powell. Alongside was Neil Mink, sporting a very nice beard and single handling his Morgan 27 Nasty Jack. All together we were whisked westward at 8 knots, running with the current. 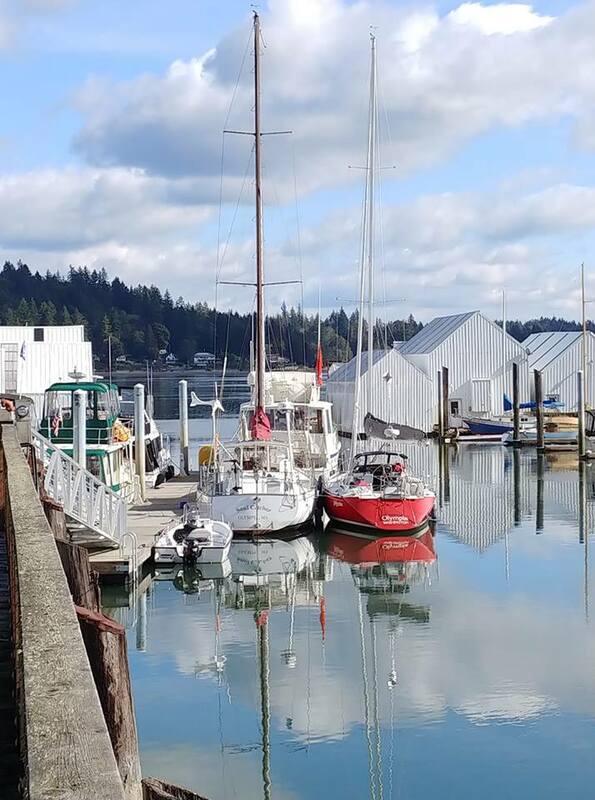 We encountered a minimum depth of 8 feet under our 6.5 foot keel at half tide as we headed toward Libby Point then Skookum Point to arrive at the final reach with good depth all the way into Oakland Bay and the Oakland Marina. I hailed the Shelton Yacht club on channel 68 and got instructions to continue into the marina. Traveler led the way into the tight marina and found a starboard tie right at the gangway, just barely squeezing into our designated slot. We took Clara June to raft on our port side. 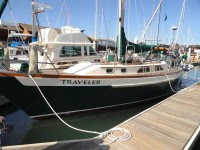 Soon afterward, Windwalker and Nasty Jack arrived and found space at the south dock. Already present was Barry and Gloria on Soul Catcher (Maple Leaf 42) and Richard Bigley on his C&C Plus, Jolly Rumbalow. Now we had six SSSS boats present for the late afternoon appetizer pot luck in the spacious Shelton Yacht Club clubhouse. Thank you to whomever it was who brought the wonderful crab dip! The Shelton folks made us very welcome. Nice people. 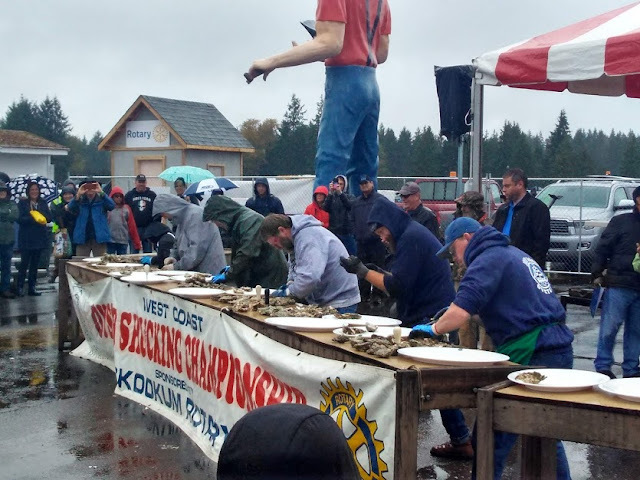 Sunday we went to Oysterfest in a light drizzle and had a great time, eating way too many oysters, watching the shucking competitions, and listening to local music. Sunday night we had a little get together on Traveler and played music into the night. Monday, up at 8, Traveler followed Clara June back down Hammersley, running with the current on a falling tide to get dumped into Pickering Passage with eddies, swirls, and upswellings pushing us on our way. We ate eggs and toast once we reached the relative safety of Squaxin Passage and Budd Inlet. 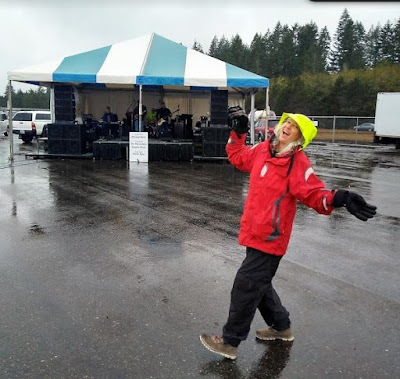 Our transit time from Shelton to Oly Town was a mere 3 hours. Would we do it again? Next year, youbetcha! The secret is to hang out at the oyster shucking competition tent 30 minutes after the event to be there when the judges emerge with twelve heaping platters of oysters on the half shell looking for volunteers to consume them. Me! Me! 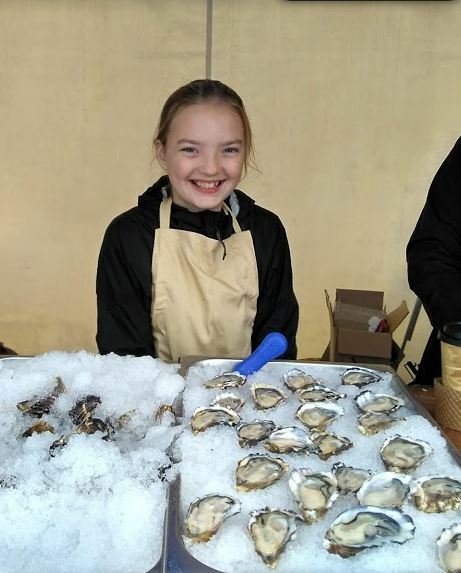 I love the Oyster Festival. Sounds lime an amazing trip. 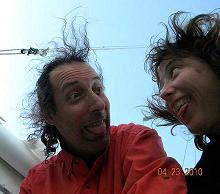 I am recently settled in Seattle and would love to go sailing with you both sometime.